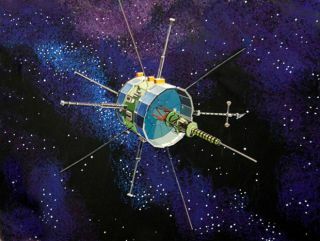 Artist's concept image of ISEE-3 (ICE) spacecraft. Now, members are trying to redirect the path of the vintage International Sun-Earth Explorer 3 (ISSE-3) probe before it's too late. "It took a lot of preparation and perseverance," said co-leader Keith Cowing, who remained behind in Virginia for co-ordination while other co-lead Dennis Wingo worked at Arecibo. Wingo's team has at the Arecibo Observatory for two weeks and is expected to leave Friday (May 30). NASA's International Sun-Earth Explorer (ISEE-3) was undergoing testing and evaluation inside Goddard's dynamic test chamber when this photo was taken. Working inside a dynamic test chamber, Goddard engineers wear protective "clean room" clothing to prevent microscopic dust particles from damaging the sophisticated instrumentation. NASA launched the 16-sided polyhedron, which weighed 1,032 lbs. (469 kg. ), from Cape Canaveral, Florida, on August 12, 1978. The team technically had the capability to command the spacecraft last Friday (May 23), but under a Space Act Agreement with NASA had to have the agency's approval before making the move. That approval finally came through Thursday (May 29). Cowing acknowledged waiting for approval took longer than he hoped, but said given it's the first time a private group wanted to do something like this, he could appreciate the agency's caution. Luckily for the group, their preparation worked: first contact went off without a hitch, with the spacecraft responding to a tone exactly as expected. "I'm doing my happy dance," Cowing said. There are numerous technological hurdles to overcome before moving the spacecraft, which is moving towards Earth but in an orbit that is not suitable for repurposing ISEE-3. Redirecting it should "ideally" happen before mid-June before the fuel demands grow very high, Cowing said. The group plans to put the spacecraft in the Earth-sun Lagrange Point 1 (ES-1), a gravitationally stable spot about 930,000 miles (1.5 million kilometers) from Earth. Getting there won't be as simple as firing the engines, however; more preparation is needed. First, the group will do more detailed communications with the spacecraft in the coming days to see which of its 13 instruments are working, where it is going and how healthy the spacecraft is overall. The ISEE-3 "away team" at the Arecibo Telescope in Puerto Rico as they attempt to contact the spacecraft. From left, Dennis Wingo (project co-lead), Balint Seeber and Austin Epps. While the exact process is still being worked out, Cowing expects controllers will first do a short test of the engines, and then make a series of engine firings over several days. If they succeed, then Cowing says it will be the time to decide what to do with ISEE-3, since it's easier to negotiate with a working spacecraft than a perhaps-working one. Commands will be sent through Arecibo from "McMoon's", a command center Wingo and Cowing originally established in Mountain View, Calif. to restore old images from the NASA Lunar Orbiter spacecraft in the 1960s. McMoons got its name from its location: an abandoned McDonald's at the NASA Ames Research Center. ISEE-3 is such an old spacecraft that it doesn't have a computer on board. Its thermostat failed years ago, and its engine has experienced excess heating in the past. But with the spacecraft now talking to the Reboot Project, there's the potential it could change its destiny – again. The spacecraft first launched in 1978 to study cosmic rays and the solar wind, but ended up doing much more until it was put into hibernation in 1997, such as chasing after two comets and examining the sun. Cowing said the success of the mission will also depend on more funding. The group raised nearly $160,000 on Kickstarter, exceeding its initial goal by $35,000, but every dollar will be needed to rent telescope time and ship needed hardware from all over the world. More campaigns will happen, but he's not sure in what form as it depends on funding from partners. This illustration shows the trajectory of the ISEE-3-ICE Trajectory spacecraft. He noted that NASA will again need to give approval before the Reboot Project fires ISEE-3's engines, but he's hoping the process will go quicker this time. "It's even more critical this time because the laws of physics are involved in this," Cowing said, referring to the fact that more fuel will be needed as the spacecraft moves further in its orbit. But he's keeping NASA apprised of progress frequently. "They know what we're doing."